The parcel was recently transferred by Barron Collier Companies to the United States for sale under an agreement that resolved Collier’s legal obligations to the United States dating back to the Congressionally approved 1988 Arizona-Florida Land Exchange Act – a deal that originally included the historic 72-acre Historic Phoenix Indian School site that had been operated as a school for Arizona Indian students for almost 100 years until its official closure by the Bureau of Indian Affairs in 1990. Proceeds from the sale of this Historic Phoenix parcel will be deposited into the Inter Tribal Trust Fund and Navajo Trust Fund administered by the United States for use by tribes in Arizona to seed educational programs and services such as tribal libraries, preschools, childcare facilities, youth foster homes, tutoring and academic counseling for tribal youth, among other programs. Most of these programs have been placed on hold in recent years due to limited funding and uncertainty surrounding the future of these Trust Funds. There are a lot of very cool homes in the Valley, but some stick out more than others. In North Central Phoenix sits a home on top of a hill that has a unique history. It used to be a train depot in Mayer, a town more than 70 miles north of Phoenix. The history is very cool. The train depot began operation in Mayer in 1898. It was in full operation until it finally shuttered in the 1950’s. For years it sat decaying to the ravages of time, but a Phoenix man named Don Dedera had a great idea: ship the depot to the Valley and turn it into a home. So, in early 1963, the train depot was placed on a moving truck and shipped south. It wasn’t an easy task. It was brought down the Old Black Canyon Highway and telephone and power lines had to be moved out of the way. At one point, the moving truck turned toward the Deer Valley Airport and was able to drive down the runway to avoid even more telephone lines. Eventually, it ended up on a hill and became part of a new home. Fast forward to a few years ago, the most recent owner, Will Auther and his wife spent nearly a year fixing up the home, and they lived in it for nearly 13 years. Now, they’ve decided to put it on the market. They hope that someone will take it over and keep the history of the home alive and help to keep the story of the traveling train depot alive. 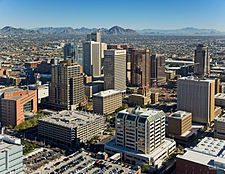 Right now, Phoenix lacks a comprehensive bicycle network connecting the downtown business district with surrounding neighborhoods. But a number of improvement projects aim to change that. 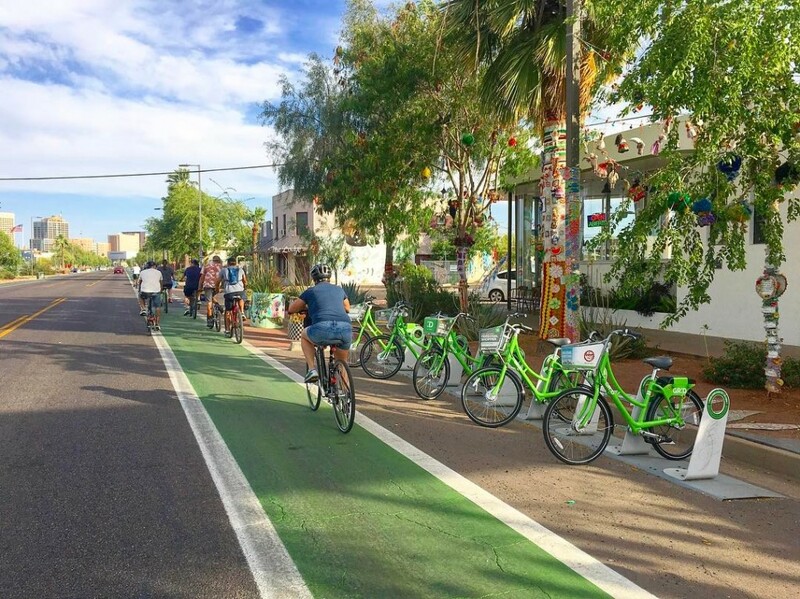 From road “diets” to restriping, the City of Phoenix is not only focusing on making downtown more bikeable, but more walkable and livable too. Six projects impacting downtown are in the works, which will add things like cycle tracks (two-way bike lanes), landscaping enhancements, signage, lighting and ADA improvements. Omar Peters, a director with the Urban Phoenix Project (UPP), sees the changes as a step toward making cycling as comfortable as driving. “It’s exciting to think about biking this entire area and it’s a nice, easy, protected and pleasurable ride,” he said. As the special projects administrator for the city’s street department, Mark Melnychenko sets up many of the community meetings advocates (like Peters) attend. Melnychenko gathers public input and helps lead the design and construction process. “Complete streets” are part of that new vocabulary, a concept that emphasizes the importance of multi-modal transportation. In fact, the city just passed a complete streets policy on June 28, ensuring all transportation improvements moving forward have things like walkability and bikeability in mind. One example of that is the First Street Pedestrian Improvement Project, which started in 2012, and is slated to conclude sometime this year. Big changes on First Street have already been made between Van Buren and McKinley Streets, including repaving, reducing the roadway width, widening the sidewalks and adding bike lanes. Those improvements will extend through the Evans Churchill neighborhood up to Margaret T. Hance Park in the final phase. Third Street is another major artery running north from downtown. And unlike 1st Street, which dead-ends at Hance Park, Third Street helps bridge the I-10 barrier from Evans Churchill into the Alvarado neighborhood and beyond. 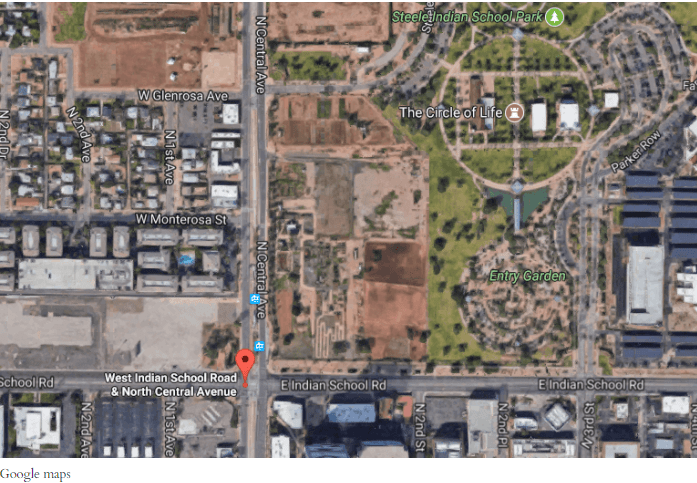 Stretching all the way up to Indian School Road, the Third Street Improvement Project will impact a lot of central city neighborhoods. It already went through the public input process, settling on design plans that reduce the traffic lanes from five to three and add buffered bike lanes. Construction will begin in late 2018 or early ‘19. 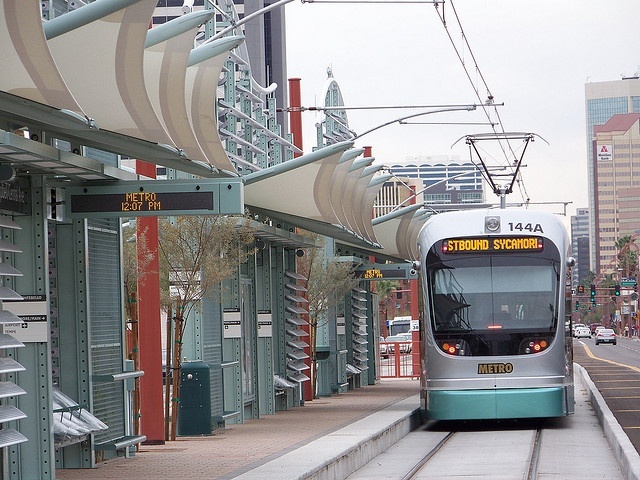 Running east-west, the Oak Street Improvement Project will tie into 3rd Street, which links with Roosevelt and First streets, and the rest of downtown Phoenix. 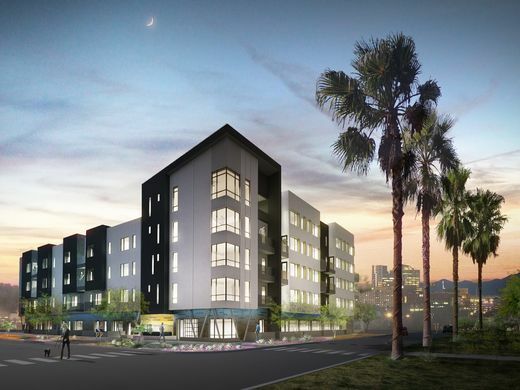 It basically provides a walkable, bikable corridor through the Coronado neighborhood (and areas east of that), in addition to easier, safer passage across major intersections like 7th and 16th streets. According to Melnychenko, the Oak Street improvements are a great example of how the city is creating one big bicycle network, while trying to keep motorists, residents and pedestrians happy. Construction on the Oak Street bike lanes is set to begin in 2019, and will eventually tie into the Grand Canalscape near 24th Street. So while many of these projects aren’t connected yet, they eventually will be. For instance, there’s a bike lane gap between Central and 7th Avenues along Roosevelt Street — but that’s about to change. The street was recently redone east of Central Avenue (along Roosevelt Row), and now it’s the west side’s turn. In addition to repaving and restriping Roosevelt Street, Third and Fifth Avenues will also get bike lane makeovers, possibly as far north as Thomas Road. As part of the lengthy pre-design process, which concluded in December 2016, key stakeholders provided input, followed by a three-day design charrette. Because of the all the new development happening in that area and connection to downtown neighborhoods like Roosevelt and Willo, a lot of community members attended the discussions. UPP was one of the groups present, pushing for cycle tracks on both 3rd and 5th Avenues, in addition to two-way traffic south of Roosevelt. The historic Garfield neighborhood east of downtown is also growing, and a new project along Van Buren Street would add bike lanes to that area as well. Spanning from 7th Street to 40th Street, the initial design provides a road diet, buffered bicycle lanes and sidewalk improvements. A road diet will be used to re-channel traffic, add bike lanes and achieve systemic improvements. While proven safer overall, diets can sometimes be a contentious issue for commuters, who don’t want lanes taken away. 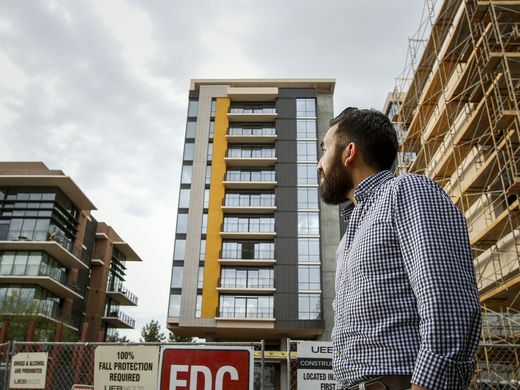 But according to Dan Klocke, executive director of the Downtown Phoenix Partnership, it’s time to rethink that mentality. Using the existing roadway and curbing, a restriping project will also affect Washington and Jefferson streets — adding bike lanes to the gap between 7th Avenue and 7th Street. Lanes currently exist just outside the “Sevens” going west toward the Woodland neighborhood, and east toward Eastlake Park. This would connect cyclists from those neighborhoods to the downtown business district, at no detriment to vehicle traffic. Many of the projects impacting downtown neighborhoods are still open for public comment. For more information on how to get involved or attend a meeting, check the City of Phoenix website. When ranking Arizona’s top 50 public high schools based on 2014 SAT test scores, the majority in the top 10 are charter schools. 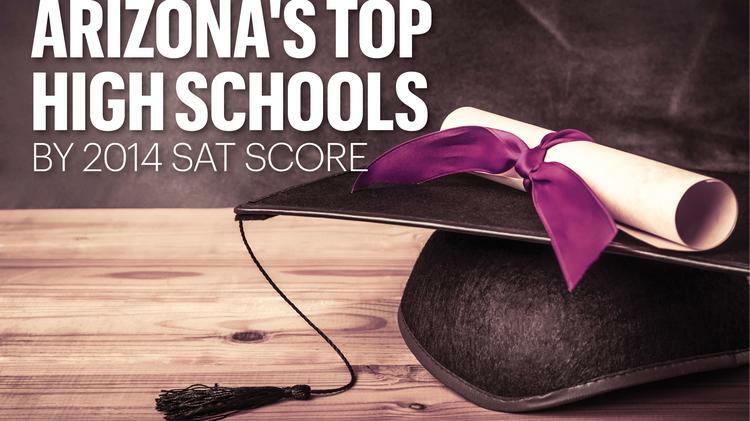 So we crunched the numbers again to look only at traditional, non-charter public high schools to see which are the best scoring school districts in the metro Phoenix area. It’s no surprise that public school districts in metro Phoenix tend to perform better in the outlying areas, especially in the East Valley, such as in Chandler and Gilbert. But it was surprising to see how close some of the other school districts are when comparing their average 2014 SAT scores. SAT test scores are a good measure of college readiness, according to the College Board, which administers the test nationwide.